GameCola Superfan No Lynch returns to review another rhythm game! It is human nature to want. And let’s face it, most of us here want more games! Good games, to be specific. What we want, we seek for, and are willing to sacrifice our cold hard cash to obtain. Sometimes what we find was a big waste of time and money. But when we do find something great…we want to share our experience with others. I can happily say that this is one of those times. If you weren’t already aware from my Rhythm Heaven review, I love rhythm games. So, when I was perusing the 3DS eShop’s demos section, two games in particular caught my eye. One I am still in the process of playing, and it’s been really good so far. The other, which you might already know the name of from the article title, is HarmoKnight. One of the wallpapers downloadable from the official site. I thought is was appropriate because the game has no box, since it’s an eShop exclusive game. 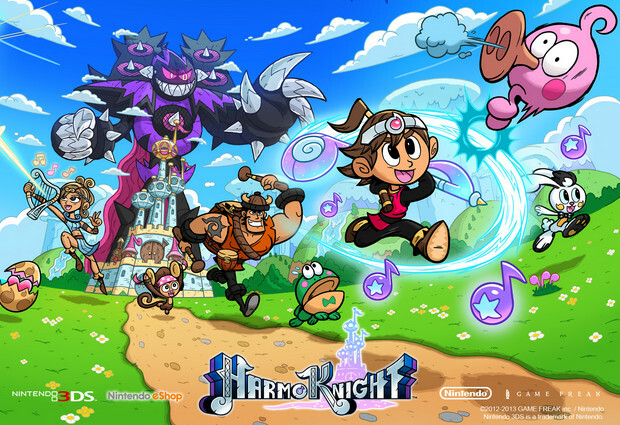 HarmoKnight was developed by Game Freak—their first non-Pokémon title since Drill Dozer, and the first actually released product of their more recent Three-Month game development set-up. Gameplay: How and how well the game plays. This includes the controls, menu navigation, difficulty, and progression. Music: How does the music sound? Is it catchy, is it tedious? Do they use different tunes for each stage or just remix the same one? Aesthetics: How does the game look, and how well do the events on-screen mesh with the music? Extras: What more do you get for doing well besides the end-of-level ranking? Satisfaction: How pleased are you to play and beat the game? The Story is as follows: You are Tempo, a young boy who lives in the musical land of Melodia. You train under Woodwin in the art of combat. Evil cacophonous noize meteors then fall from the sky, bringing evil aliens, Noizoids, whose racket causes all the wildlife to turn violent and murderous. You then take a magical staff found in a salamander-thing’s belly (Don’t ask. It’s never explained.) to the princess, so a true warrior can wield it’s full powers. Because you, as the main character, obviously can’t. You meet two others on your way; Lyra and Tyko, who for the most part do nothing but serve as sources of dialogue, since Tempo doesn’t talk. The princess gets captured by Gargan, the leader of the Noizoids, when you arrive. The latter then puts everyone in the castle city to sleep for some reason. Plot is mostly ignored from here on except for dialogue before bosses, but at the end, you rescue the princess and save the day. Though it technically brings no significant new themes to the same old story, it’s enjoyable and funny enough to blend in well with the gameplay experience. Since we’re talking about it, the Gameplay is very nice as well! The controls are simple, A or Y to attack, B or X to jump, Start to pause, and navigation around the overworld with the D-Pad, with pressing Y when on the map bringing up the stage list and Start saving the game. These controls are used in the meat of the game itself, which is an endless-runner with the music directly tying into your movements. Notes float in abundance throughout the stage and hide inside enemies, and it is your job to collect as many as you can, to get a higher stage ranking. If it wasn’t clear, you attack the enemies and jump to avoid obstacles and to collect notes in the air, while the stage’s music plays. Failing to hit an enemy or dodge an obstacle will result in the loss of a heart, or instant failure on the stage in the case of falling into a bottomless pit. Hearts are your health; you start with five, and can have up to eight at a time, with healing in the middle of stages. Loss of all your health is, quite obviously, a failure of the stage. The notes you collect determine your ranking for the stage; whether you got a “Great!”, “Good!”, or “So So…”, from most to least notes, respectively. One of the rankings in question, alongside which is your companion’s comment. The map navigation is mostly linear; you follow a set path of levels, finishing one to move on to the next. You work your way like this through seven different worlds, each with their own musical style and design aesthetic. In the first world, you meet Lyra, in the second world, you meet Tyko, both of which sometimes come in and you play as them for part of the stage. Both literally only get four levels each. The boss battles also have a different style from the regular stages, essentially being a game of Simon with proper timing being required and taken to an epic scale. Overall, the controls are easy to get into, so you have enough time to get them instinctualized before you encounter the difficulty spike that is the endgame. Menu and overworld navigation are simple enough to understand, though you might have to fight muscle memory because Start isn’t the menu button. Gameplay wise, HarmoKnight is fair. It provides enough challenge for the perfectionistic completionists, while being still fun for the casual gamer who enjoys exercising their rhythmic abilities. Of course, in each stage the Music is also extremely prevalent. My opinion on the music as a whole? Meh. I mean, it’s good music, but the way it’s set up is that all levels of a certain stage aesthetic have a slightly remixed version of the same tune to have different enemy placements. 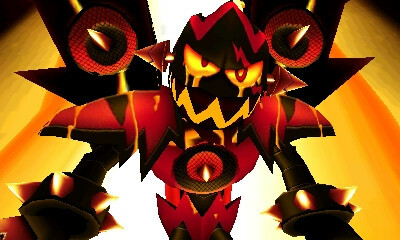 This means the running of the game is about 10 different songs, excluding the unique boss themes. The music is fun to listen to as part of the level, but the soundtrack as a whole could have benefited from a greater variety. Oh, and Pokémon music is available as bonus stages, kinda forgot to mention that. The style of the Aesthetics in HarmoKnight are very comic-esque, complete with comic-book style onomatopoeia in most of the boss battles, and the expository cutscenes being told in comic panels. The 3D models work very well, being both visually appealing and functional. The running and attacking animations are smooth, and there is no framerate drop throughout the entire game, even in the system’s 3D mode. The characters’ designs are quite nifty, and the Noizoids’ very design aesthetic is something I’d love to see more of in games. The environments are also fine, but they don’t really get much attention when you’re too busy focusing on surviving to take it in. 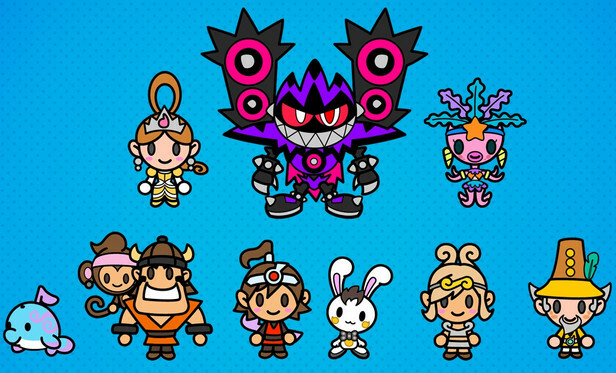 For your daily cuteness overload, here are chibis of the characters. Now for the Extras, your rewards for doing well! What is really the theme for the prizes in this game is more challenges. 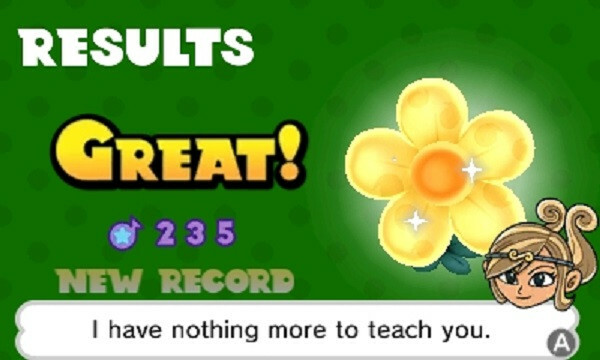 Earning a stage’s “Good!” or “Great” nets you a Royal Note, your proof of beating that stage, and the latter also reaps you the level being unlocked in Fast Mode. This lets you play a stage at double speed. Achieving a Fast “Great!” rewards you with concept art for the game, which is either very cute, or very cool. Also hidden in certain stages in the game are pink birds, Pinklefs. Finding all five Pinklefs unlocks World 8, Sky Roost, which holds challenge stages of the seven most prevalent design aesthetics/musical styles, as well as the hardest level in the entire game. There is no notification message for 100% completion, by the way. You just finish it, rejoice, and then either start the game over, or move on. Don't let the bearded character on the box fool you—this is 100% '80s JRPG.